Discussing & Signing Don’t Label Me: An Incredible Conversation for Divided Times (St. Martin's Press). Enter Irshad Manji and her dog, Lily. Raised to believe that dogs are evil, Manji overcame her fear of the “other” to adopt Lily. She got more than she bargained for. Defying her labels as an old, blind dog, Lily engages Manji in a taboo-busting conversation about identity, power, and politics. They’re feisty. They’re funny. And in working through their challenges to one another, they reveal how to open the hearts of opponents for the sake of enduring progress. 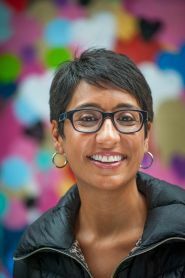 Irshad Manji is founder of the award-winning Moral Courage Project at the University of Southern California and the New York Times bestselling author of The Trouble With Islam Today, translated into more than thirty languages and later adapted into the Emmy-nominated PBS film Faith Without Fear. Oprah Winfrey selected her as the first winner of the “Chutzpah” prize for boldness. Manji has lived and taught in Toronto, Vancouver, New York, and Los Angeles. She and her wife reside in Hawaii with their rescue dogs. Diversity of viewpoint is the essence of democracy. Which is why we won't save democracy by putting labels such as "racist" on those who support the Trumps of our time. A truly new global order requires a new way to tribe out. Enter Irshad Manji and her dog, Lily. Raised to believe that dogs are evil, Manji overcame her fear of the "other" to adopt Lily. She got more than she bargained for. Defying her labels as an old, blind dog, Lily engages Manji in a taboo-busting conversation about identity, power, and politics. They're feisty. They're funny. And in working through their challenges with each other, they reveal how to open the hearts of opponents for the sake of enduring progress. Readers who crave concrete tips will be delighted. Studded with insights from epigenetics and epistemology, layered with the lessons of Bruce Lee, Ben Franklin, and Audre Lorde, punctuated with stories about Manji's own experiences as a refugee from Africa, a Muslim immigrant to the United States, and a professor of moral courage,Don't Label Me makes diversity great again.